Register for the Shadid Award ceremony. 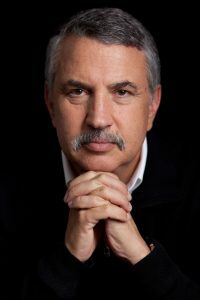 Thomas Friedman, three-time Pulitzer Prize winner and journalist for The New York Times, will join the Center for Journalism Ethics for a keynote conversation at the presentation of the Anthony Shadid Award for Journalism Ethics. Mark your calendars for “From Beirut To Jerusalem to Washington: Reflections on 40 years of Middle East Reporting” April 5 at the National Press Club in Washington, D.C.
Friedman, known for foreign affairs column reports on domestic politics and foreign policy, Middle East conflicts, international economics, environment, biodiversity and energy, was awarded the Pulitzer Prize in 1983 and 1988 for coverage of the Middle East. He was awarded the 2002 Pulitzer Prize for Distinguished Commentary for “his clarity of vision…in commenting on the worldwide impact of the terrorist threat.” In 2004, he was awarded the Overseas Press Club Award for lifetime achievement and the honorary title Order of the British Empire by Queen Elizabeth II. The winners of the 2018 Shadid Award will also be at the event to talk about the ethical decisions they made while reporting. The award recognizes ethical decisions in reporting stories in any journalistic medium, including print, broadcast and digital, by those working for established news organizations or publishing individually. Learn more about past winners and about Anthony Shadid.